This Crockpot Italian sausage soup recipe is hearty, filling, and full of flavor. A wonderful and easy set it and forget it soup recipe. Another day, another easy slow cooker soup recipe. This Italian sausage and bean soup really hits the spot. If you read my blog with any regularity, you’ll notice that I’ve posted a lot of Crockpot soup recipes lately. It’s just that time of year I guess. I love the ease of slow cooking! As with many of my other Crockpot recipes, I keep the prep time fairly short so you can pop it on before work, or you can go to bed and have a delicious piping hot bowl of soup when you next check your Crockpot… with minimal exertion. 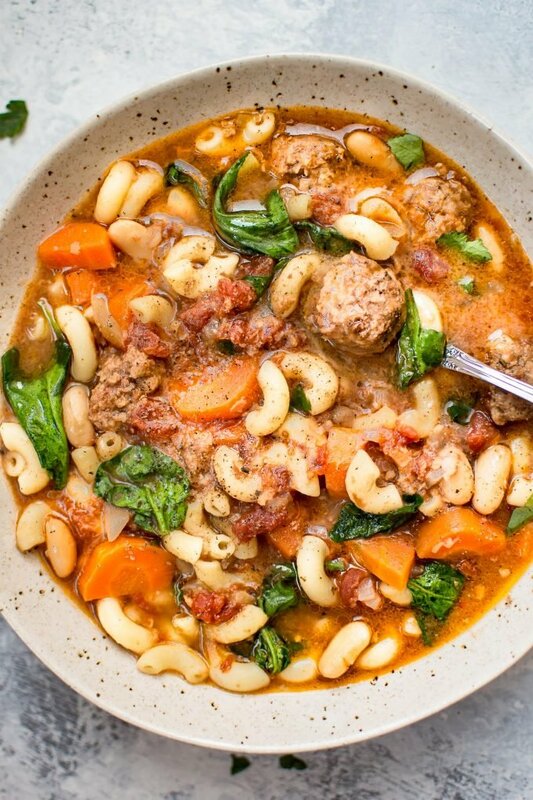 This slow cooker Italian sausage soup recipe is filled with veggies, so you can feel good about eating it. I used mild Italian sausages, but feel free to use hot ones or any other uncooked sausage that you fancy. Pro tip: I didn’t brown the sausage before adding it to the Crockpot, but you can definitely do that if you wish! This soup is nice and comforting. Between the sausage, pasta, and hearty tomato broth, we’ve got a lot of yummy stuff in here. I let this soup cook for 8 hours… but you don’t need to be exact here. A bit less or bit longer won’t hurt. When this Crockpot white bean and sausage soup is about done, you stir in the pasta. Let it cook for another half hour or so, add in the spinach, and then dish it up. As with any soup that contains pasta, I think that it tastes best served fresh. Leaving it makes the pasta soak up the broth even more, so be prepared for that. You can always add more veg broth in to replenish the liquid if necessary. Hope you love my slow cooker Italian sausage soup recipe! Let me know in the comments below if you’ve tried it. What’s your favorite fall or winter soup recipe? Prep your sausage, onion, and carrots. I find it easiest to take the sausages out of their casings and then break them into bite-size pieces. Add all ingredients except the pasta, spinach, and salt & pepper to a slow cooker. Cook on low for 6-8 hours. About 30 minutes prior to serving, add the pasta and stir the soup every 10 minutes or so to prevent it from sticking on the bottom. When you're 5-10 minutes away from serving, stir in the spinach and season the soup with salt & pepper as needed. Serve immediately. Regarding the sausages, anything around the 17.6 ounce mark would work. I bought a pack of 5 mild Italian sausages for this recipe. This is the 7 quart Crockpot I used for this recipe. You may also like my Crockpot cabbage soup with beans, sausage, and potatoes, my Crockpot lemon chicken soup, or my vegetarian tortellini soup recipe. This sounds so yummy, does it freeze well? Thanks, Nancy! I think if you added the pasta after you thaw it, that would be fine. The pasta will probably be mushy if you freeze it with the pasta in it. I’m probably being dumb, but did you precook the sausage? I totally forgot to come back and tell you how delicious this soup was! I chickened out and browned the sausage before adding it to the slow cooker haha. This is a new family favorite! Thanks!!! Lol no worries. Thanks for coming back. So glad you liked the soup and nothing wrong with browning the sausage!! Hi, can you sub Kale for spinach? Or is the spinach providing additional flavors and textures? Not a dumb question. 😊 Nope, I put it in raw. If you wanted to brown the sausage beforehand, it wouldn’t hurt, but I don’t think it’s necessary. Can you double the recipe when needing to feed more?? Hi Kirstin! Doubling the recipe won’t fit into a standard size Crockpot, unfortunately. Maybe you can borrow one from a friend and make two batches at the same time? I made this tonight to break in the new crockpot and it was great! Thanks so much, I love your site. Can this be made on a stovetop? Absolutely! I haven’t tested it myself, but I don’t see why it wouldn’t work. I’d still add the pasta and spinach in closer to the end of cooking. Let me know how it goes! Can you add other vegetables to this soup? Sure! I don’t see why not. Hope you enjoy the soup, Michelle! Yay!! So happy you liked it! Can you use ground Italian sausage instead? It seems like it would be simpler. Is there a version for the Instapot? Hi! Thanks. I don’t have one specifically, but I’d brown the sausage in the IP (saute setting), add the remaining ingredients except for spinach, and cook it on high pressure for 7 or 8 minutes. Just be sure not to exceed the max fill line, so you may need to add less broth (not sure since I haven’t tested this). Add the spinach in at the end and let it wilt for a couple minutes. Let me know how it goes if you do try! I sure will! I have made your recipe twice by the slow cooker-awesome each time! Your Instapot method worked perfectly. Excellent!! Thanks for letting me know. Great soup on a cold winter night! Used chicken broth instead of vegetable broth, because it was what I had in the house. Removed sausage from the casing and did not fry before adding. Turned out great. The house smelled wonderful all day, Highly recommend.